Botox and the Nefertiti Neck Lift can help! We have a non surgical solution for you! Botox and the Nefertiti Neck Lift Can Help! The Nefertiti Neck Lift is a new procedure that uses Botox to redefine the elegant lines of the jaw and neck for a youthful, tighter, more contoured appearance without surgery. This procedure is a new technique that improves the definition of the jaw line and rebalances the underlying muscles to “lift” the neck and jaw area. The end result is tighter skin and fewer wrinkles. 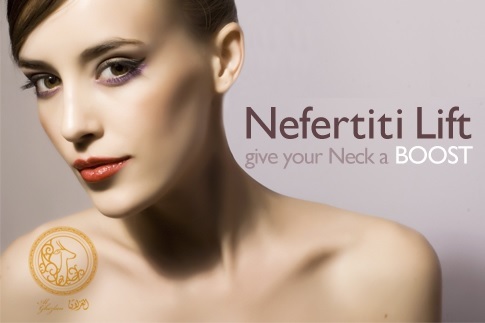 Why choose the Nefertiti Neck Lift? The Nefertiti Neck Lift is a new procedure which redefines the elegant lines of the jaw and neck for a youthful, tighter, more contoured appearance without surgery. Muscle relaxing injections into the jawline and upper neck create an upward movement of the skin. The Nefertiti Neck Lift provides a sharper–looking jaw line border and uplifts the corners of the mouth. Patients are left with an elegantly defined jawline and smile on their face because of this incredible procedure. Does the Nefertiti Neck Lift treatment require maintenance? Like all BOTOX® or Dysport™ procedures, a maintenance process is required for the effect to continue. It is suggested that the treatment is repeated every three to four months.